SWAN is your source for reliable plumbing and HVAC needs in Westminster, Colorado. With more than four decades of combined experience, our industry certified technicians are ready to assist you with the experience and knowledge to finish the job right the first time and keep you comfortable all year long. We are standing by, available 7 days a week, to address any of your Westminster HVAC and plumbing needs, so just call us today! Or, click here to schedule your Westminster plumbing or HVAC service online. SWAN stands behind all plumbing and HVAC work completed by our technicians. We offer a 100% Satisfaction Guarantee for residential work completed in the Westminster area. We always offer upfront pricing so you know exactly what to expect with no hidden charges. Click here to view all of our Plumbing & HVAC Service Guarantees! The winters can be quite long in Westminster, Colorado -- especially if your boiler or furnace isn't functioning. Our Westminster HVAC technicians offer affordable heating system repairs and installation to keep you and your family warm. Our furnace technicians have the knowledge and experience necessary to diagnose and repair all types of furnace issues like worn thermostats, motor failure, failed thermocouples, and bad motor belts. We will recommend repairs when it is the most cost-effective solution, but all furnaces eventually need to be replaced. A gas furnace may last up to 18 years before it needs to be replaced, but replacing a 15-year-old system may save you up to 15% on utility costs. Most residential boilers last four around 12 years before they fail. Is your boiler failing to keep your entire home at an even temperature? If you have rooms that are too cold or too hot, it may be a sign that your boiler needs to be replaced. Our Westminster boiler experts will diagnose the problem and recommend repairs when cost-effective, or help you select a new boiler that will help lower your energy costs each month. Whether you have a clogged shower drain or a leaking pipe, we understand that you want the problem fixed quickly. SWAN Plumbing, Heating & Air plumbers can handle plumbing jobs large and small. We repair, install, and maintain residential plumbing systems, water heaters, and sewer lines to keep your plumbing system working as it should. Our licensed Westminster plumbers perform a wide range of residential plumbing services, from drain cleaning and leaky pipe repair to re-piping and water heater repairs. Whether you have water pressure issues, a backed-up sewer, or rusty colored water, we will get to the bottom of the problem and keep your plumbing system working like it should. 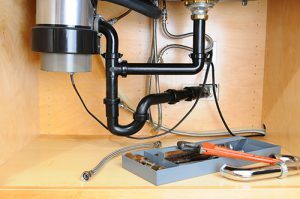 Common plumbing services we perform for Westminster homeowners include: leaky pipe repair, garbage disposal repairs, water heater repairs and installation, copper re-piping, drain cleaning, and sewer repairs. You probably don't give your water heater much thought until it stops working. All water heaters eventually reach the end of their life. Sometimes there is no option but to replace the water heater, but we will get to the bottom of any issues like rusty water, running out of water too fast, or a lack of hot water. If repairs can be made, we will advise you if it's more cost-effective to repair or replace your unit. We repair and install all types of water heaters in Westminster, including electric, gas, solar, and tankless units. Sump pumps are usually out of sight and out of mind, but these simple devices worth around the clock to keep your basement dry and safe. If your basement has frequent flooding or water issues, sump pump installation can be a good way to protect your home and keep out the water. For only $99 (reg. price $199) we will send one of our clean cut, highly trained & qualified, drain cleaning technicians to your home in Westminster, CO and fix any issues you may be facing with drains or sewer line right the 1st time! We offer a full range of drain / sewer line cleaning, drain snake & sewer scope services for all residential Westminster plumbing customers. Your air conditioner keeps you cool and comfortable throughout the warm Westminster months. Our Westminster AC technicians install, maintain, and repair all types and brands of air conditioners. All air conditioner systems eventually need repairs. Whether you have low air flow, electrical failure, damage to the compressor, a refrigerant leak, or improper maintenance, our Westminster AC experts will correctly diagnose the problem and recommend the best course of action. You may need AC repairs if your system is less efficient than it should be or it is operating very loudly. Maintenance is the easiest and most cost-effective way to reduce AC repairs, extend the life of your AC system, and keep your utility bills as low as possible. 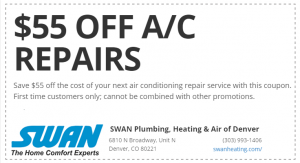 SWAN offers affordable AC maintenance programs in Westminster. Our 22-point AC tune-up program includes a thorough inspection of your air conditioner and duct work as well as calibration, filter replacement, refrigerant adjustment, and cleaning. Central air conditioning systems can last anywhere from 15 to 20 years at the most before they begin to fail. Even before that point, the system may use far more energy than a newer model. Your air conditioner may be ready to fail if it is over 10 years old, operates loudly, has been repaired more than twice in the last couple of years, or your home has a dust or humidity problem. Our Westminster air conditioning installation experts will help you choose a new AC system that can save you up to 20% on utility costs.